“At Shola our aim is to take you back to an era of simple, clean cooking, the way it has been done in our family kitchens for decades,” explains Aida Khan, speaking on the launch of her first restaurant. Joining the likes of Waka and The Athenian at White City Place – former home to the BBC headquarters – Shola follows a successful Gourmet Karachi Supper Club, championing Pakistani cuisine through a menu rooted in family recipes passed down through generations. Shola intends to prove Pakistani food can be light and healthy, with a menu set to include the likes of Timatar Ka Kut, a Beef Seekh Kebab, Kurkuri Bhindi and Khattee Daal. 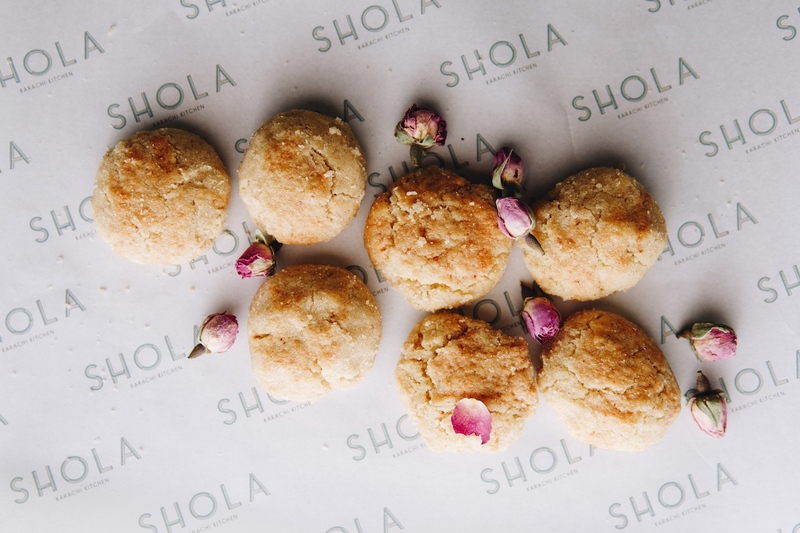 Dessert will feature dishes such as Naan Khatai – sweet-savoury cookies originating from the Indian subcontinent: the recipe for which Aida Khan has shared to tie in with the launch of Shola. Sift together flour, semolina and baking soda, then add sugar, cardamom, nutmeg and salt. Mix in the ghee, a spoonful at a time, and rub together. Line a baking tray with baking parchment paper and grease it. Create small balls out of the dough and flatten the top slightly. Brush with egg yolk and sprinkle the crushed pistachios. Bake in the oven for 15-20 minutes until tops are golden. Shola is open now and can be found at White City Place, 201 Wood Lane, London W12 7TU. Further information can be found here.